Easy for me to say. Right? Yeah, well, that's because I looked it up. I was sittin' around bored out of my skull, just pickin' my nose the other day… No, really. I was actually picking my nose. C'mon, admit it. You do it too. We all do it. It happens in even the best of families. Some say what happens in your nose should stay in your nose. But they're lying. They do it too. So as I was going for gold I was wondering where the hell all that stuff you pick out of your nose comes from. It really builds up, doesn't it? t mean, let's say you didn't pick your nose. Would it grow and grow until it eventually exploded? At the very least we'd have to breathe out of our mouths. We're doing our nose - and our intelligence quotient - a favour by cleaning it out like that every day. Oh, come on, sure I do it every day. Sometimes twice a day. And I like it. It's gratifying. Hell, at my age it's about all I've got left that's gratifying. By the way the average is about four times a day so I've got a ways to go. Wikipedia says: "Small particles such as dust, particulate pollutants, and allergens, as well as infectious agents bacteria are caught in the viscous nasal or airway mucus and prevented from entering the system. I didn't know that. So then if you didn't pick your nose your viscous nasal mucus system could break down. And what does one do once one has nudged their nose nuggets? I mean apart from exclaim "We've got a winner!" Some people flick it. Others collect it. Others wipe it in a Kleenex. And still others eat it. Yeah. You read that right. They eat it. Now there are two schools of thought about this. One is that it's beneficial because it helps strengthen the body's immune system. The other of course is the exact opposite; that those nuggets are full of germs and will make you sick. It makes me sick just thinking about it. 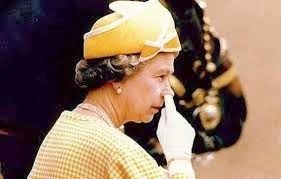 So what's the proper etiquette when it come to discarding your nose pickings? I'm not sure. All I can say is you can pick your nose and you can pick your friends but you can't wipe them under the couch. Combine it with your ear wax and create "art". Damn, Reffie, I was gonna do ear wax next week. I don't pick my nose. I'm a lady. I clean it with a tissue. I don't get too much. My allergy, that gives me permanent sniffles, prevents it from building up, so it only needs cleaning about once a week. Not even a little pick when no one's looking, Babs?